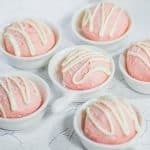 Strawberry Fat Bombs are a great low-carb keto snack our Cream Delight version makes them that much more delicious, providing a high serve of fat wrapped up in a delicious bite-sized snack. Mix cream cheese, double cream, coconut oil and protein powder with a hand mixer for 5 minutes, until well combined. Set the mixture in the fridge for 1 hour. When the mixture is set, rub your hands with a little coconut oil and shape the mix into 10 evenly sized fat bombs. The coconut oil will stop the mix from sticking to your hands. Store the fat bombs in an airtight container in the fridge or freezer.